We’re all about sharing hacks here at The Mouse For Less. And during the Epcot Food and Wine Festival, we have, perhaps, one of the best hacks you can utilize! During this season of delicious food and beverages, it really is a smart idea to have the Quick Service Dining Plan! 2 Quick Service Meals: One entrée and one non-alcoholic OR alcoholic (guests over age 21) beverage for Breakfast, Lunch and Dinner. Obviously, there are many ways for this to play out, but as you can see using Disney’s Magic Your Way Quick Service Dining Plan can help guests save a significant amount. We just took an average number of options during the Epcot Food and Wine Festival, so your mileage may vary, but the chances of you saving money per day with the Dining Plan could be substantial! During each festival, the family in our example saved over $20 by using the Quick Service Plan as opposed to paying for those meals and snacks out of pocket. 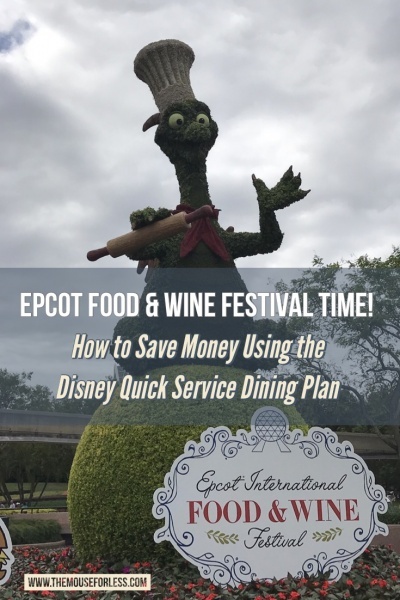 We invite you to have some fun and play around with the menus to see how you could save using Disney’s Quick Service Dining Plan during the Epcot Food and Wine Festival. What tips do you have for saving money during the Epcot Food and Wine Festival? Let us know in the comments, or on Facebook or Twitter. Want to visit Walt Disney World during the Epcot Food and Wine Festival? Contact The Magic for Less Travel for more information and a free, no-obligation quote.